This was originally a private communal garden laid out for the use of residents of St Peter's Square, built 1825-40. It was designed by J C Loudon and reflected his theories about the important relationship between houses and gardens. Threatened with development in 1912, the garden was acquired by Hammersmith Borough Council in 1914, redesigned and opened to the public in 1915. It contains a statue, 'Greek Runner' by Sir William Blake Richmond, whose family donated it to the Council and which was erected here in 1926. 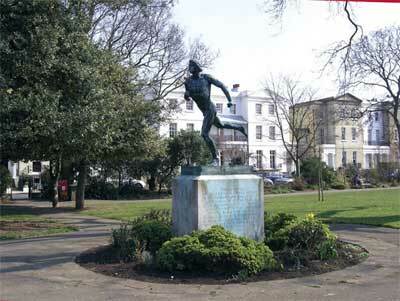 LBII: Statue of Greek Runner in gardens. Surrounding houses: Nos 1-18 consec and 18A; 19A & 19B, Nos 22-29 consec. (Former laundry building to rear of No. 22 and Nos. 45 to 47 (odd) British Grove included within curtilage); Nos 30-38; Albion House, Radcliffe Lodge, Nos 45, 46 & 46A. Formerly a private communal garden for residents of the surrounding houses, St Peter's Square Garden was acquired by Hammersmith Borough Council in 1914 and opened to the public in 1915. Although some detached houses existed here by the mid C18th, the land was largely fields, commonland and woodland. Residential development of the area from King Street to the Thames began in the early C19th and the St Peter's Estate was built between 1825-1840. The connection with the river was lost when the Great West Road was constructed in the 1950s. The focus of the scheme was St Peter's Square, whose houses and streets were of a more substantial scale than the rest of the locality, and overlooked a rectangular central garden. This was designed by J C Loudon and reflected his theories about the important relationship between houses and gardens. The architect of the surrounding houses may have been his colleague Edward Lapidge, who designed St Peter's Church. The fine houses around the square are generally in groups of three that each give the appearance of being a detached villa, and some retain original ironwork and railings. There was originally an Engine house and well 310 feet deep in the centre of the garden that supplied the surrounding houses with fresh water. In 1912 the garden was threatened with development but preserved through its acquisition by Hammersmith Borough Council at a cost of £5,660. The Council laid out the garden as a simplified version of the earlier layout with a perimeter path replacing the more elaborate path layout. It was opened to the public in 1915. Three mature trees remain, one at each end and one in the centre. In 1928 the garden was described as 'An attractive and well-kept open space, containing some well-grown trees.' On the site of the Artesian well is a bronze statue, 'Greek Runner' (1879) by Sir William Blake Richmond who lived and worked in the parish. The statue was presented to Hammersmith Borough Council by his family and erected here in July 1926 as a memorial to him. The stone plinth has the following inscription: THIS STATUE REPRESENTING A GREEK RUNNER WAS DESIGNED AND EXECUTED BY SIR WILLIAM BLAKE RICHMOND KCB RA WHO LIVED AND WORKED FOR MANY YEARS IN THIS PARISH. IT WAS PRESENTED TO THE HAMMERSMITH BOROUGH COUNCIL BY HIS FAMILY AND WAS ERECTED IN THIS SQUARE AS A MEMORIAL TO HIM BY THE BOROUGH COUNCIL JULY 1926. Primarily a portrait painter, Sir William was also a Borough Councillor, a JP, Slade Professor of Fine Art at Oxford and President of the Coal Smoke Abatement Society. He is best-known for his mosaics in St Paul's Cathedral (1892-1904). The garden has three fine mature trees, and is now surrounded by reproduction cast-iron railings based on the original pattern. St Peter's Square won a Green Flag Award in 2010/2011 for the first time.